the bright blue spruce tree available now! The hunt started at midnight and will continue through January 9. 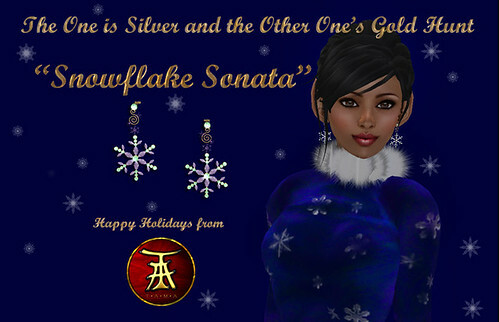 There are some very cool offerings in this hunt, including Snowflake Sonata, a beautiful set of gem earrings at our very own TAMA Jewel in Linji. In addition, watch for Christmas Trees from me and my RL business partner, MAB. These beautiful Spruce trees come in a set of three, copyable at 3000L and transferable at 1200L. So what do you get? A small, medium and very tall tree. Each tree can be used year round with changeable textures for Spring, Summer, Fall and Snowy Winter. In addition, there is a dead, burned and snowy-burned which are great for Halloween and for Goth. The ornament linksets come on the small and medium trees and feature 5 unique and newly designed sculpted ornaments with beautiful changing textures (four for each of the five designs – the textures include a great goth set) and beaded garlands with four textures as well. The gorgeous star can be silver or gold. On top of these textures, you can layer a tint for a number of holiday colors. 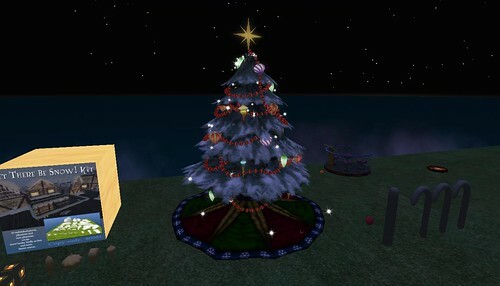 The scripting also allows you to size, move or rotate the decorations and add or modify for glow, shine and full bright for a beauteous tree in night conditions. TAMA Motors is going to have a very exciting event on the 12th of December. Look for more details soon. Get ready to rock and be rocked!!! You’re a tiny and ready to guard tinies against all who set out to do evil or eat their waffles without permission! In a single box, you’re ready to don your gear cuz weze packed this with fittings. The Tiny Dark Crusader comes with a variety of pieces fitted to many fo the Wynx Tiny Avatars to try and facilitate your fit. The fox will fit most and you will find pieces that we saw needed adjustment for any particular avatar and named them for your recognition. Should you still require our assistance in being fitted properly, please feel free to contact us and we will be happy to assist you. Be aware that, as tinies are fully primmed avatars, we sometimes can accidentally move one of our body parts. As you try to fit your avvie, you may find that moving back/forward or to one side will fix things up. Holy torpedoes, there’s tiny bosoms in this thing! You’re absolutely right. Saving the world isn’t just for the guys….all you need is these protective metal bosoms in their gravity-defying awesomeness! And then there’s the BatHawk Avenger! Only an astounding 11 sculpted prims! Sleek, fast, fun to ride….the essence of a great sidekick for the tiny superhero! Available at Tiny TAMA and TAMA Motors now! Also, check out our new TAMA Motors at Swords. Taunting Lindens, Dunking Lindens..setting things to right! Here’s your chance, and while doing your soul a bit of good for all the missing inventory, the times you were ruthed, gased, naked, or any other number of mind-numbing annoyances, you can help raise money for OXFAM! It’s all taking place at the Jewelry Fair 2009 where I and some other 130 SL jewelers have their gorgeous gems for sale until September 27. Some of your favorite jewelers are also putting their bejeweled butts on the line (so to speak), along with Lindens, to be dumped for charity. Don’t let them down…or rather…DO!…with your wicked curve balls. C’mon down for a great cause and get decked out while you DECK A LINDEN! Several pieces at the jewelry fair will benefit Oxfam. The JEWELRY FAIR starts tomorrow, September 18th, 2009, and everyone is in high gear getting their beauteous goods into their booths. Never has Second Life seen so many scurry over two sims so fast, but those nano prims are flying and all to make you beautiful and many to benefit Oxfam International, the fair’s choice of charity. TAMA can be found at Booth 7 in the Spring section of the four-season maze that hopes to evoke the theme of the fair, THE SECRET GARDEN. TAMA has several selections that are premiering as well as favorites from past seasons. We hope to see you all there and wish everyone a fruitful and glorious fair and that Oxfam will benefit from everyone’s generosity. The fair runs through September 27th and to keep your philanthropic spirit alive, there will also be kissing booths (PUCKER UP!) and dunk booths (SLIDE’R HOME!). It’s that time again…when baubles and bangles shine bright and gather in delicious formation all for the love of ornament and making us feel pretty….and raising a few lindens for a worthy cause. This year that cause is OXFAM and I will shortly show at least one special piece that I’ve made (will make a second if I have time). I have several pieces premiering at the show of which I am very excited and will show them the first few I’ve completed and add a slideshow of what I’ll be offering shortly before the show. It is always wonderful and satisfying to review one’s previous work and be able to see growth both in design and execution. Second Life is always a learning process for me as I grow in building skills, especially with the introduction of better sculpting tools both inworld (Sculpt Studio) and my 3D program offworld, Luxology’s Modo. I have been teaching a lot in SL and this always spurs me on to develop my craft in order to help my students excel which in turn boosts me as well. SoCool Destiny has a set of scripts at XStreet which have allowed me to offer my customers a wider range of things they can have within the scope of a single product. I thank him for all his assistance and always being kind enough to help me troubleshoot (operative word being “user-error”…heh) and add more and better features. The first four completed sets show off these new features, which I am calling “Vari•Set” and give a good taste of the stylings I am offering this season. As soon as I have landmarks and other information, I will post them. I hope to see you all there. TAMA and Tiny TAMA have added Motorcycles and motorcycle parts to their product lines. 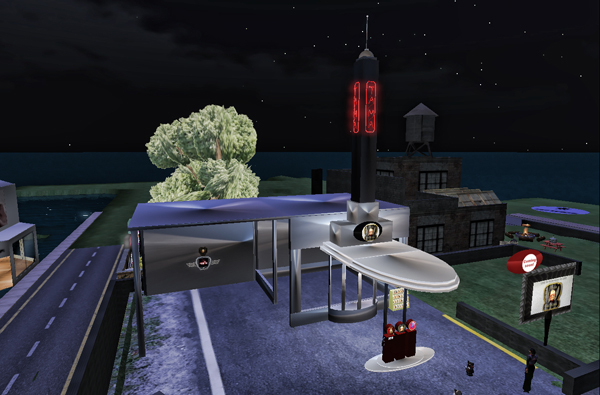 We have a brand-spanking-new store to display our wares which I based on the design of the old Sinclair Gas Stations. The nifty shapes seemed perfect when I kept the garage open and added more window space to the parts side. Fox has sculpted the cool neon signs for our TAMA Motors that reads on the four faces of the tower above the store. Along with oil can displays, and those great fuel pumps from that same era, it’s a great way to show what’s new and hot at TAMA Motors. Right outside the store is a joiner for the TAMA Motor Group. No worries; it doesn’t take up one of your SL group slots. There is also a rezzer for you to try out one of the bikes while on the RocknRoll sim. Lots of great places to see and shop and a drag strip to test your skills! So what happened to The Oh! Factor, you say? Well, Fox and I have been doing business together for some time and it just seemed logical to fold in The Oh! Factor to keep the TAMA brand fresh with its products for regular-sized avatars and continue to grow Tiny TAMA for the knee-high tinies. I know I haven’t put out clothes for the regular folk for some time now, but that’s soon changing. I have some outfits that never made it out due to time and so many other constraints, so those will finally see the light of day (unless you like to set to midnight, of course). In addition, there are some great new leather outfits coming that will be usable by the biker crowd, but will have available accessories to make them keen wear in the fantasy and RPG worlds. We have motorcycle parts, in full-perm versions, and other items coming including some stunningly beautiful bikes chock full of sculpted details. We take suggestions and several parts have come from customer requests already. 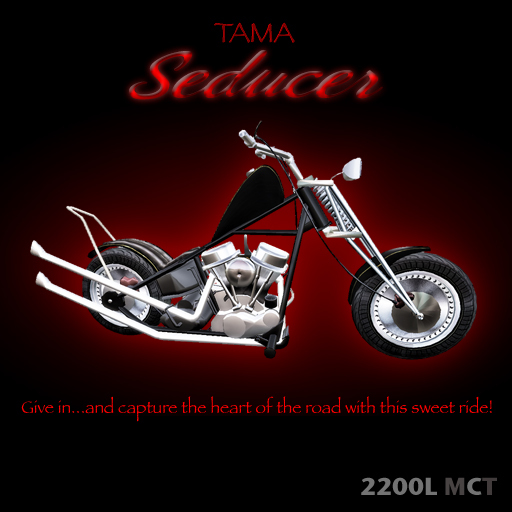 The SEDUCER is the first on the market, with superb handling and many touches seldom or never seen in SL. Ladies, we kept you in mind with our EN version of the Seducer. Plus 2 Biker-sized versions are included as well. All for the single price of 2200$L. Can’t wait to show you the new ones coming up! Now, lest we forget the tinies…..NOT!…the tiny version has many of the fine features of her larger sisters, but with reworked handles to accomodate those tiny arms. This is a high-calibre machine for a tiny with taking-on-the-road in mind. Priced at 1795$L. We even have a ridable toy-sized version that you have to see to discover just how much fun it can be! We call this the Big to Tiny, or B2T version, and it comes in at 1500$L. BUT WAIT, there’s more! Ok, regular-sized and tinies-sized come, boxed, with all four bikes (one tiny and three regular-sized) for . The regular-sized and B2T version are packaged at. And finally, all three (well, really five total) give you a WHOPPING SAVINGS with a price of only 3999$L. So come on down and see our new store where we are always FULL SERVICE WITH A SMILE! text adventure on holy tiny dark crusader!